Standout Stone Cottage Plans . . . Compact to Capacious! The charming stone cottage plans featured here range from small and cozy . . . . . to roomy and spacious. However, regardless of size, each of the designs retains its enchanting cottage look and feel! The small cottage plan that follows is from Southern Living House Plans. Designed by Dungan-Nequette Architects, Hillstone Cottage evokes the charm of a 1920s period revival cottage -- complete with a steeply pitched roof and a large stone fireplace and chimney anchoring the front facade. The main level, pictured in the floor plan below, encompasses a total of 1,050 square feet in living area. It features a fairly spacious living room with a stone fireplace, and opens onto a rear porch. In addition to an efficiently designed kitchen, the main level includes two bedrooms, two baths, and a laundry room in this stone cottage plan. The upper level encompasses an additional 398 square feet and can be finished off to include another bedroom, bathroom, and a library or office loft. There is also ample room for walk-in storage space on Level 2. See More Small Cottage House Plans! The charming storybook design that follows is from Garrell Associates, based in Suwanee, Georgia, USA. Fern Creek Cottage is a mountain house plan that features a steeply pitched roof and picturesque twin stone chimneys on its front facade. The main level features an open and airy floor plan encompassing 2,264 square feet. The primary living area is just beyond the entry hall, which opens into a huge dining and lodge room with a massive fireplace flanked by built-ins. Overhead is a beautiful coffered ceiling. A set of French doors in a wall of windows opens onto a large rear porch that features a corner fireplace and a grill. A gourmet kitchen also opens into the large dining/lodge room. It features a center island and a wraparound bar with plenty of counter space for entertaining. The spacious master bedroom suite includes a large walk-in closet and also boasts a set of French doors that open onto a private rear porch. A grand master bath features dual sinks, a separate shower, and a luxurious corner tub with a fireplace! Completing the main level are two additional bedrooms, a full bath, and a mudroom/laundry room. An optional second floor plan is also available for Fern Creek Cottage. It includes an additional 457 square feet of living area and can be finished off for use as a sleeping loft, study or game room in this stone cottage plan. 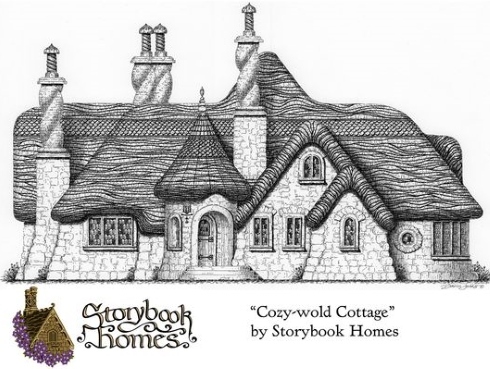 See More Storybook House Plans! The picturesque European or English stone cottage plans that follow feature a romantic stone cottage that is larger than it may first appear. Encompassing 3,212 square feet on two levels, it includes plenty of living area for a growing family. Despite its size, it manages to retain a cozy cottage look on its facade. Designed by Visbeen Associates Architects and available from Builder House Plans, this cottage plan includes four bedrooms and three and a half baths. The main level, pictured below, features a great room with a fireplace and doors leading to a rear porch and expansive patio area. The kitchen features a center island, walk-in pantry, and a built-in breakfast nook. A set of French doors leads from the kitchen to a spacious screened porch. A formal dining room and den are also included in this stone cottage plan. Completing the main level is a powder room, laundry room, and a rear entrance/mudroom off the attached two car garage. In addition to four bedrooms and three baths, the upper level features an open loft area at the top of the stairway. Numerous windows in multiple gables and gable roof dormers flood the interior with natural light -- including the master bedroom suite -- which features a master bath with dual sinks, a separate shower, and a tub cleverly tucked into one of the light filled dormers. In addition to the master suite, two of the other bedrooms boast walk-in closets. See More Picturesque English Cottage House Plans! Elbert Way, pictured below, also draws its inspiration from the English cottage style with its sweeping roof lines and mullioned bay windows. The recessed front entry opens to a large wraparound porch -- complete with its own outdoor stone fireplace and chimney. Typical of English cottage design, Elbert Way mixes stone with other building materials such as brick and board and batten siding on its exterior for a more picturesque effect. Designed by Mitchell Ginn for Southern Living House Plans, the bright, open and airy interior of 3,469 square feet on two levels features 10 foot high ceilings on the main level and 9 foot high ceilings on the upper level. The main floor, pictured below, encompasses a total of 2,486 square feet. Its primary gathering area is a spacious family room with a large fireplace and a beamed ceiling overhead. To further expand the space and bring the outdoors in, three sets of French doors open onto a large covered porch at the rear. The kitchen also opens to the family room and features a snack island and butler's pantry. The master bedroom suite is also located on Level 1 and includes two huge walk-in closets. The master bath features dual sinks, a private toilet, separate shower, and a spa/Whirlpool. Completing the main level is a dining room, a second bedroom/office with a large bay window, a half bath, laundry room, and mudroom leading from the attached two car garage at the rear of the home. The upper level consists of 983 square feet and includes two bedrooms and two full baths, as well as a large loft area at the top of the stairway. A corridor leads to an unfinished attic at the rear, where there is plenty of space for storage in this stone cottage plan. The Southern country farmhouse design that follows is the largest of the stone cottage plans featured here. Created for Southern Living House Plans by Gary/Ragsdale, Inc., the Lavendale encompasses a total of 5,397 square feet of living area on two levels. Amazingly, despite its rather large size, it manages to retain its charming cottage look and feel! A lovely wraparound porch covers the front entry. Inside, the foyer features a soaring cathedral ceiling and an elegant curved stairway. To the right of the foyer, a set of double doors leads to a study with a fireplace. Adjacent to the study is an open dining room. Both the study and dining room feature a set of tall French doors that open onto the covered wraparound porch. To the left of the foyer is the living room. Straight ahead is a family room that also features a soaring two story cathedral ceiling. Centered on one wall is a large fireplace flanked by built-ins. A wall of windows at the rear includes a set of double French doors that open onto a covered patio or terrace. Opening into the family room is a large kitchen and breakfast area. It features a center island, walk-in butler's pantry, and a cozy corner fireplace. A spacious master bedroom suite is also included on the main level. The bedroom features a tray ceiling and a French door that leads to the covered rear patio. The large master bath features dual sinks, a private toilet, separate shower, and a corner tub. In addition, it leads to two walk-in closets -- one of which is absolutely huge! Completing the 3,173 square foot main level of this stone cottage plan is a half bath, a rear stair hall, and a mudroom/laundry room that leads to an attached two car garage. The upper level is punctuated by a series of charming gable roof dormers. Encompassing 2,224 square feet, it is occupied by three additional bedrooms -- two of which include walk-in closets -- and three full baths. At the top of the rear staircase is a game room that overlooks the family room below. At the rear of the second level is a bonus room that can be finished off for use as a fifth bedroom or guest room in this stone cottage plan. See More Stone Cottage Plans! Please check back often or subscribe to our RSS feed, as we frequently add new stone cottage plans to our site.